Continuing Gyral’s industry-leading reliability, versatility, quality and practicality. Control traffic, raised bed farming and traditional cultivation with Gyral seeders. 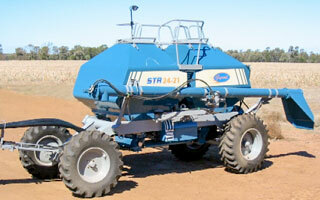 STR: Rear Trailing Air Seeder. 2 or 3 Bin, 1000kg - 4000kg bins. SR: Single Axle. 2 or 3 bin, 820kg to 1320kg bins. SR Dolly: Single Axle with Dolly Wheel. 2 bin, 820kg to 1700kg bins. SK: Single Axle. 2 Bin, 600kg bin. Chassis: Gyral’s seeder chassis to suit 2 and 3 bin machines are made from heavy-duty structural channel. Wheel Centres: Bolt-on wheel extensions and interchangeable front axle make it easy changing wheel centres for control traffic farming. Seed bins:- Pressurised 2.0mm thick Zincanneal bins with 500mm2 openings with pivoting air-tight lids. Platforms & Handrails: Strong, sturdy and non-slip platforms and ladders with safe handrails. Ground Drive & Gearbox: Multi-gear selection for easy, positive sowing rate changes. Magnetic clutch standard on all ground-drive models. Hoppers: Single or Double tier hopper with removable metering cartridge. Grain Discharge chute for calibration and unloading. Quick Release: Primary hose quick release coupler and hydraulic breakaway couplers as standard. Distributor Heads: Gyral’s mechanical distributor head assembly for accurate distribution. Single- or dual-head assemblies available. Fan & Cooler: Fan and oil cooler fitted standard to all seeders. Fan air intake is through the oil cooler. This helps to maintain normal hydraulic operating temperature and to assist in dehumidifying the air stream, improving the handling of fertilisers. Hectare Metre: Mechanical hectare metre positioned so that it can be easily read when calibrating. Contact us at Excel to discuss your Gyral Air Seeders requirements.